Industry leaders from Rabobank, Bremer Bank, and Accenture discuss some of the most pressing issues in financial services today and how Business Spend Management can help. Financial services firms are under constant pressure to increase efficiency across their operations while managing complex compliance requirements. Many firms are challenged with complex operating structures and cultures that don’t always embrace change. In order to thrive, firms must focus on the needs of each user as they embrace digital innovation— and leverage the power of cloud technology to improve operational efficiency and create measurable value. 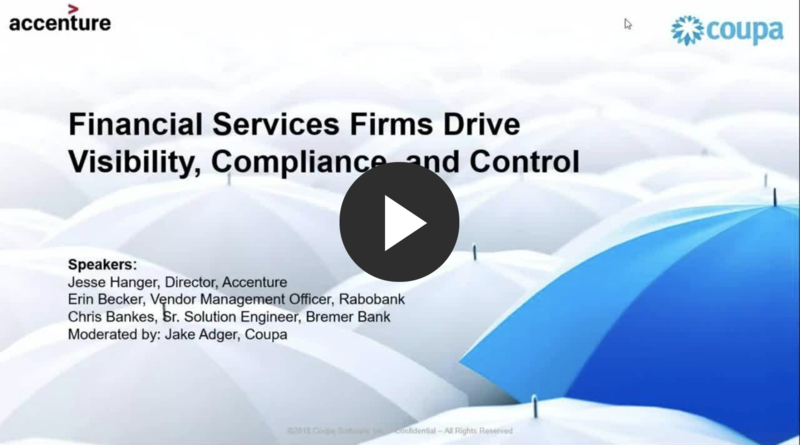 Listen to industry leaders from Rabobank, Bremer Bank, and Accenture discuss how Business Spend Management (BSM) can help address many of the most pressing issues in financial services today.